Courtney competed both of our homebred boys at this event. On Saturday she rode Star Dazzler (Simon) at Training. He put in a solid dressage test placing 6th out of 17 horses. Then the rain began. Courtney & Simon were still able to jump well going clear on cross country and doing well in stadium to move up and finish in 3rd. Then it really poured. Sunday dawned nice and sunny for Who’s a Star (Tag) and his Intermediate / Preliminary competition (Intermediate dressage and stadium jumping with Preliminary cross country). Tag started off in the dressage placing 7th; then he put in a good stadium jumping round on to the fairly difficult course, adding only a rail to move up to 5th. 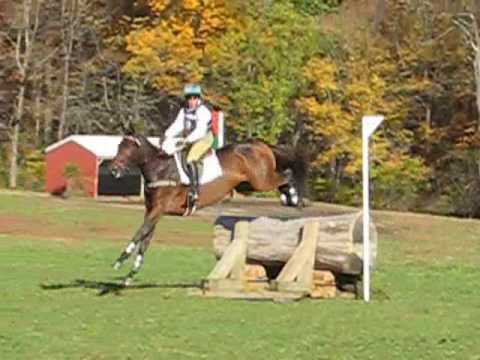 Next he jumped clear on the cross country to move up again and finish 4th.